The "Speakers’ Bureau" is designed to give Rotary Clubs a broad selection of dynamic, inspiring speakers, who are willing to speak at your club function for no charge. 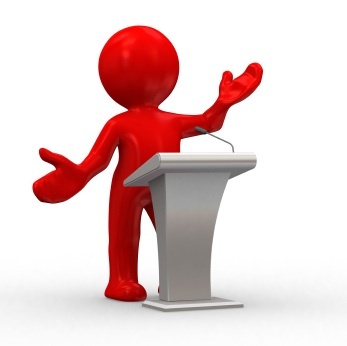 In response to the request of many Rotarians, your Rotary District 5840 Leadership Team is creating a Speakers’ Bureau, to give your club a selection of dynamic, inspiring speakers, who are willing to speak at no charge. Ideally, our Speakers’ Bureau list will allow your club to conveniently contact, invite and coordinate all logistics, well in advance of your weekly meetings, special events or service projects. Uplifting speakers may keep you, your members, prospects and guests, meaningfully engaged with Rotary’s ideals. To become a member of our Speakers’ Bureau, please email the speaker’s name, contact info and their topics to alice.white@ttu.edu Topics that are engaging will help attract a larger audience for your club’s programs. Watch the District website www.Rotary5840.org for the upcoming information on the Speakers’ Bureau, as it becomes available. Thank you for your help. Your sharing of Rotary and the many things it is doing around the world, will enrich the lives of many. To view a compiled list, to date (3/15/19), of potential speakers, click here. Please Google each speaker, to find their current contact information.